This Blair Stereo Hawkeye Model No.2 (Serial No. 5031) is a rollfilm camera for 3-1/4 x 3-1/4 image pairs. A pair of Rapid Rectilinear lenses are mounted in a lacquered brass Bausch & Lomb Stereo Automat shutter. Several models were made from 1904 - 07. 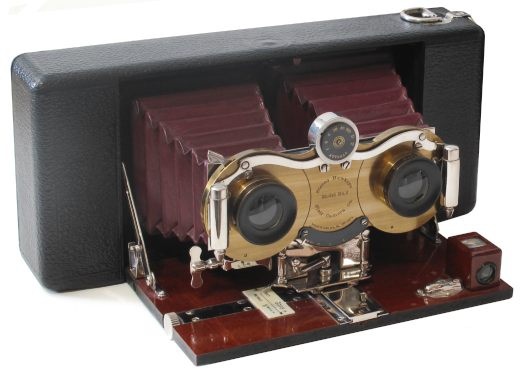 The camera is resplendent with highly polished mahogany, bright nickel trim, brass shutter, and maroon bellows. Elegantly sweeping nickel arms connected to the central shutter speed adjustment dial gives the Stereo Hawkeye a distinctive look.